I love podcasts, particularly when they cross over with my love of content marketing. Podcasts, in general, are a growing phenomenon. On the supply side, the latest data shows there are roughly 700,00 podcasts shows and some 28 million episodes. On the demand side, listenership continues to grow as well, with about 51% of the US population having listened to a podcast in 2018. If you’re looking to learn or be entertained, podcasts are a great way to fill ‘lost time’ – for instance, you can’t read a book (easily) while walking or driving to work or while grocery shopping, but you can easily listen to a podcast. In any case, there is no shortage of podcasts nowadays, and many of them are wonderful for catching up on the wonderful world of content marketing. First off, let’s cover the content marketing podcasts that cover the craft of writing, the art of blogging, and the science of blog growth. There are many great podcasts in this category, and more of them are being produced all the time. One of my favorite creators and thought leaders in the content marketing space in Jay Acunzo, and this is his podcast. In it, he riffs on best practices and why they’re not always the best route to success (and often, they’re not best practice at all). While most of the themes touch broadly on content marketing, the podcast covers unconventional thinking in business more generally. It’s a great way to get out of the echo chamber of hollow advice, and to really put on your thinking cap when it comes to strategic business growth and content creation. Jay Acunzo is a great original thinker, and his podcast will help you think in a similar way. SEO and content marketing are so intertwined, that in a strategic sense, it’s hard to decouple them completely. 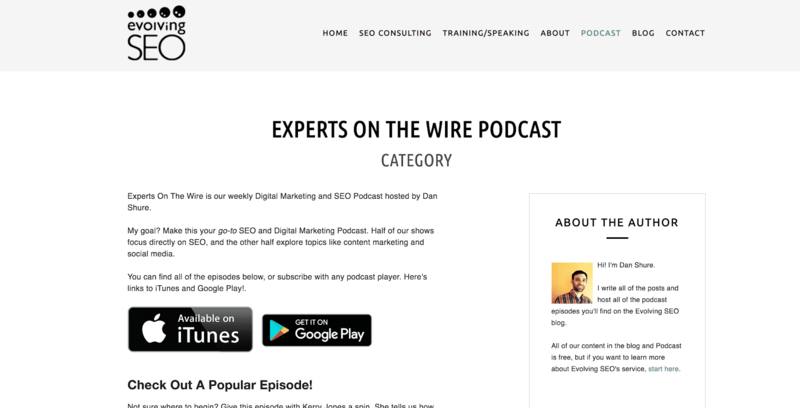 While this podcast, Experts on the Wire, is an SEO-heavy podcast, it still touches on many important content creation, optimization, and strategy topics. Dan Shure is the host, and while he riffs on many original ideas, he also gets top tier guests in the field of digital marketing. They cover a wide range of backgrounds as well, some being in-house SEOs at big enterprises and some being freelancers or agency owners who help clients build their content and SEO programs. Overall, it’s one of the more entertaining content marketing podcasts. Dan Shure is a great host and keeps things interesting. It’s also super educational. We’ve interviewed Jimmy Daly, the Director of Marketing at Animalz, in the past. He and Animalz represent some of the most interesting and original thinking in the content marketing space. The podcast is similar to their blog, in that they cover interesting strategic concepts and thoughts that are refreshing in their originality. While it’s not the most tactical and nitty-gritty content, it will likely change how you think about your approach to content marketing. They sometimes interview top experts, but will often cover and riff on their own concepts and frameworks. 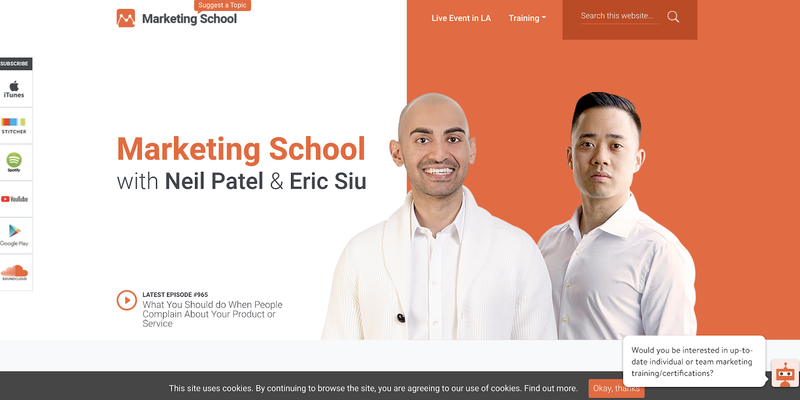 Marketing School, hosted by Neil Patel and Eric Sui, offers bite-sized wisdom that is super actionable and easily digestible. If you’re looking for a podcast with smart insights and actionable takeaways, most of them focused in some way or another on SEO and content marketing, then this is the podcast for you. Of course, they cover more than just content marketing. 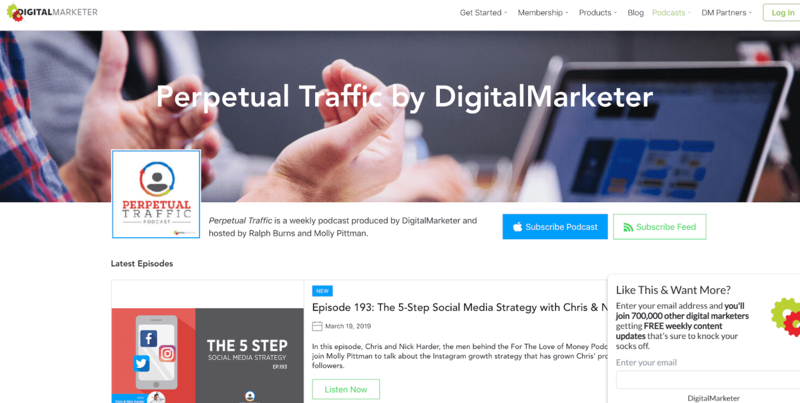 They walk into areas like sales, analytics, and general business growth, but both Eric and Neil are considered some of the top names in content marketing, and as such, I consider this one a must-listen content marketing podcast. Copyblogger, now under the broader umbrella of Rainmaker Digital, is one of the foremost publications in the content marketing spaces, and they were one of the earliest voices in the industry. They’ve always been a great resource, particularly in the tactical motions of copywriting, storytelling, and building a great blog. Their podcast, Rainmaker FM, follows this trend. They dive deep into the topic they explore, and they sometimes feature interesting guests working for companies (in-house or agency) of various sizes who are out there doing the work and getting results. Amy Porterfield is another very well-known name in content marketing, and her podcast is a phenomenal resource for all things online marketing. It brings you expert interviews, mini execution plans, and intimate behind-the-scenes secrets from her biggest launches. All of this is super actionable, and the podcast is an enjoyable listen as well (I find some marketing podcasts to be a big dry, but this one keeps my attention well). 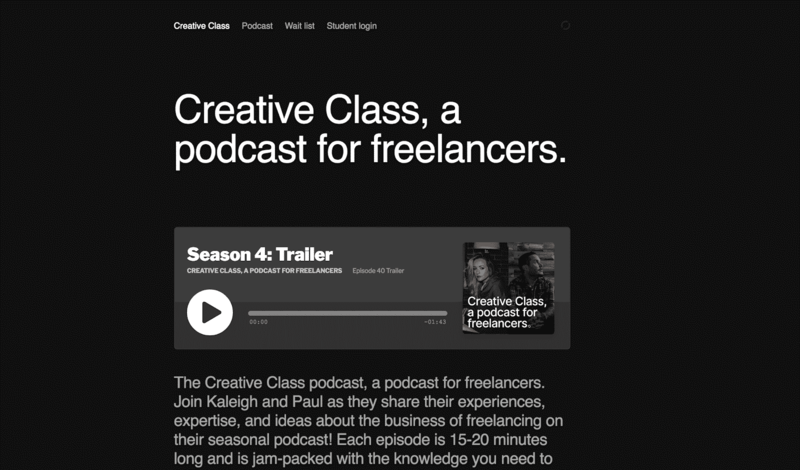 Creative Class, hosted by Paul Jarvis and Kaleigh Moore, covers things from the freelancer angle. In it, the hosts share their experiences, expertise, and ideas about the business of freelancing. Each episode is 15-20 minutes long and is quite actionable. While this podcast is uber-focused on the freelancer side of things, I put it squarely in the content marketing podcasts because of its pertinence to many content marketers. First, many content marketers work fully freelance, but even if you’re in-house, it’s likely that now or in the future you’ll do some sort of freelancing. This podcast will help you do it right. Even if you yourself never freelance, it’s almost guaranteed you’ll hire a freelance content marketer, and this will give you good insights from the other side. The Blog Millionaire, as it sounds like, helps you learn how to blog effectively and make more money from your efforts. Clearly this is very important if you run your own shop – whether you freelance, own a business, sell books, sell courses, whatever. But it’s also an interesting podcast if you’re in-house, as it covers lessons to make any content marketing machine more effective. It’s more focused on the information product marketing crowd, but you can learn a ton from these folks no matter what industry you’re in. 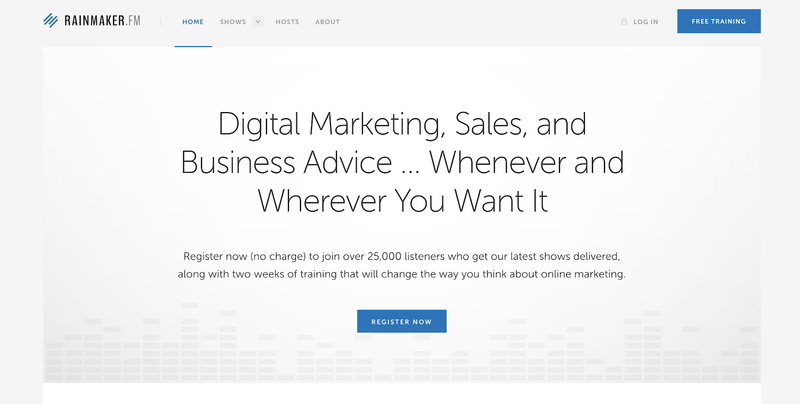 The folks at Digital Marketer are a great resource for anyone in online marketing, but I find them particularly interesting on the topics of content marketing and business growth. This podcast heavily covers those topics, but also expands beyond to other areas of website traffic acquisition, covering things like social media, paid ads, and SEO as well. The hosts are great, and I frankly just trust what they’re saying because they’re doers – they put into action what they talk about, it’s not just idle thought leadership. Also, they have a great and diverse collection of guests they interview. 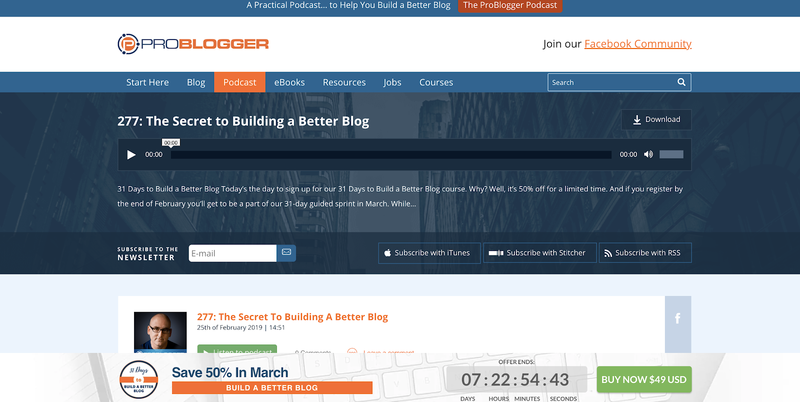 Last but not least on our “content marketing podcasts” section is the ProBlogger podcast. ProBlogger is, again, one of the original and earliest voices in this space. Their blog was formative in my understanding of blogging, particularly on the business side of things. They still offer one of the best job boards for finding blogging jobs and also for finding good freelance bloggers. It caters a bit more towards the solo-blogger, but again, you can learn a ton no matter where you work or what size company you work at. 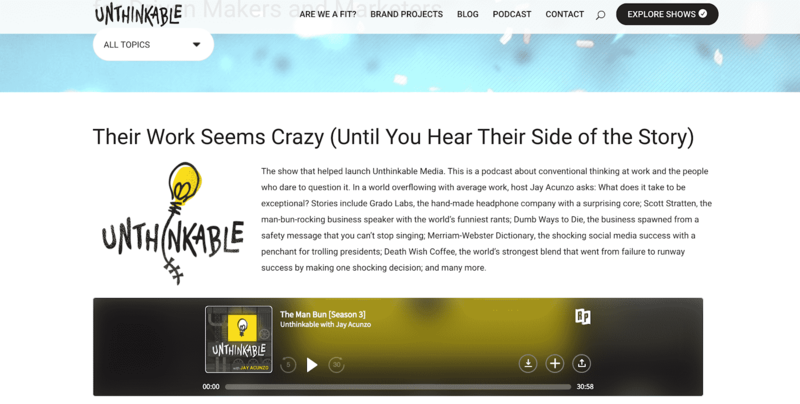 This section covers podcasts that aren’t specifically related to content marketing. They’re data-focused shows, but data is incredibly important in architecting a content strategy, and that is becoming increasingly more important with time. Almost all of our content crafter interviews mention the fact that content marketers should get good at data skills. These are my favorite podcasts for data nerds. The Digital Analytics Power Hour podcast is my favorite all around data podcast. The hosts, Michael Helbling, Moe Kiss, and Tim Wilson, are all great and engaging. In addition, they get fantastic guests on each episode to chat through different areas of data, analytics, and strategy. 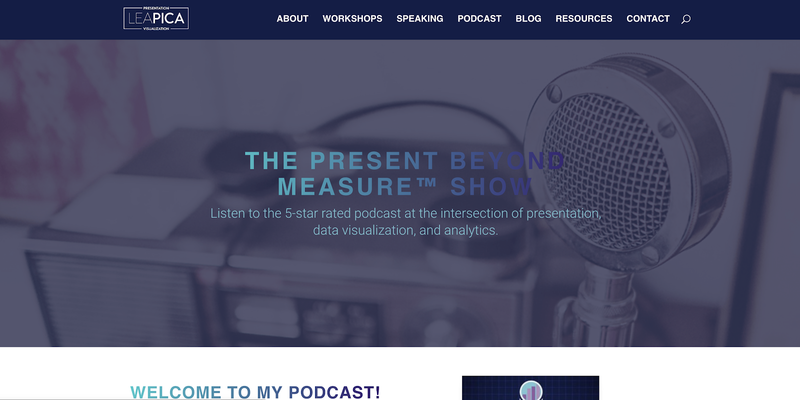 Present Beyond Measure, hosted by Lea Pica, is focused on data storytelling, visualization, and presentation. This makes it particularly interesting to content marketers, as data storytelling and interactive journalism become bigger trends. This podcast explains how to make your data more understandable and compelling. It’s actionable and entertaining and has a good ensemble of guests as well. 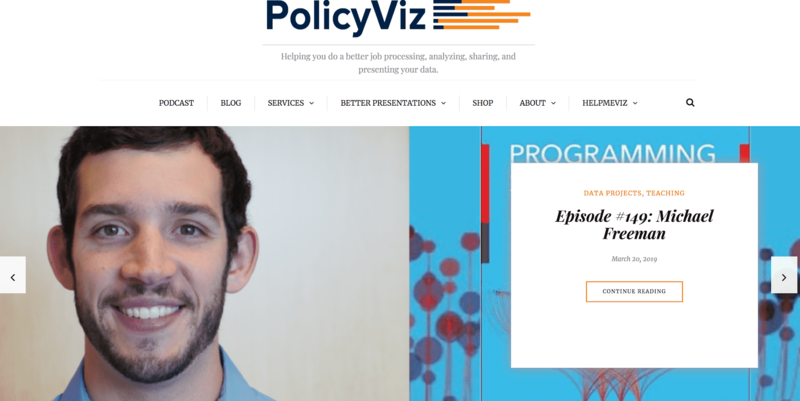 PolicyViz gets a little wonky and nerdy, but it’s still a phenomenal resource for non-technical content marketers. It’s fully focused on data visualization, but it’s not specific to the digital marketing space. I actually find that to be a huge relief, as we can often find our most interesting insights by looking at what others are doing in adjacent industries. The Data Skeptic is an interesting podcast for both beginners and trained data scientists alike. Their earliest episodes are a wonderful primer in data science topics like linear regression and SQL, and their later episodes go super deep with interesting interviews with working data scientists. Sometimes this podcast gets a bit advanced, but I still think it’s worthy of a listen if you want to learn and understand data topics better. Finally, our last category: general business growth. I realize that many of the podcasts above could theoretically fit into this category simply because it’s very broad, but I wanted to save this one for true “Growth” focused podcasts. Things about startup growth, traction, etc. These topics are important on a macro level, and content marketing is often an engine by which companies grow. These are some of my favorite podcasts in this field. 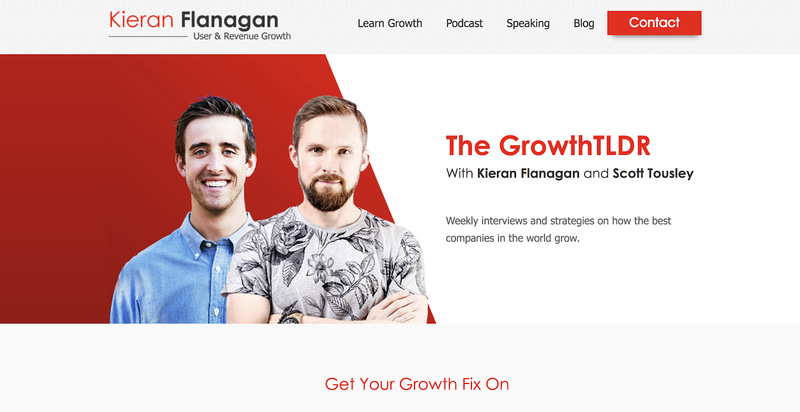 The GrowthTLDR Podcast is hosted by HubSpot marketers Kieran Flanagan and Scott Tousley. 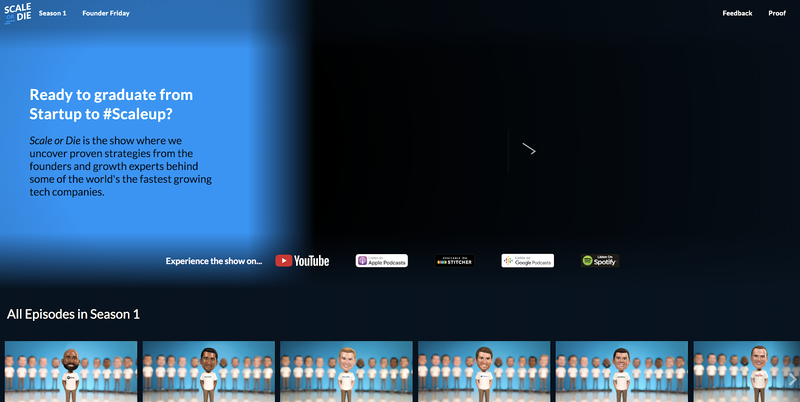 They feature interviews with growth experts from high-growth startups and agencies, and they often run about 30-45 minutes. I find the podcast to be a fun listen, as the hosts are very personable and engaging, often touching on many topics and digging deeper with good questions (as opposed to a dry and formal Q&A format). It’s also actionable. I always walk away with a good nugget of wisdom or some tactic I want to try. Scale or Die is produced by the team at Proof and featured insightful and action-packed interviews with growth experts. They aim particularly at the startup crowd and have guests on from companies like Drift, Lawnstarter, and Teachable. Finally, one of my favorite podcasts and one of the best produced shows: Masters of Scale. This one is by Reid Hoffman, founder of LinkedIn and PayPal. He interviews amazing startup founders and thinkers and creates well-produced and narrated stories that clip together different pieces of interviews that form a cohesive story. There are tons of podcasts out there, so many that it can feel overwhelming knowing where to start. That includes content marketing podcasts. More and more are published every day. Luckily, it’s easy to pick up and put down podcasts, trying several and seeing which ones you like. This list should give you a great start to begin filling your dead time with amazing and impactful content marketing shows designed to educate and entertain. Do let us know if we missed any amazing podcasts! I saved 3 hours uploading this post from Google Docs to WordPress using Wordable. Try it yourself here.